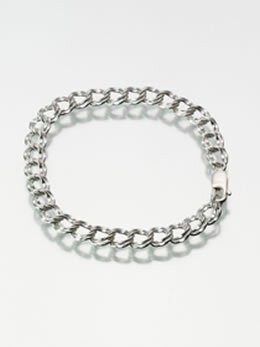 A Sterling Silver Double Link Bracelet is an alternative to the necklace commonly used for cremation jewelry. The bracelet can be used as a charm bracelet or to attach a cremation keepsake pendant. Bracelet has a lobster claw clasp for secure closure. Click on the gray tab titled Detailed Images to view the clasp and bracelet. A jump ring to hold your pendant or charm is included. Jump rings should be soldered by a local jeweler to ensure secure attachment. Note: Dove pendant shown in photo is not included. Keepsake Pendants are sold separately. Bracelet is shipped in a gift box.